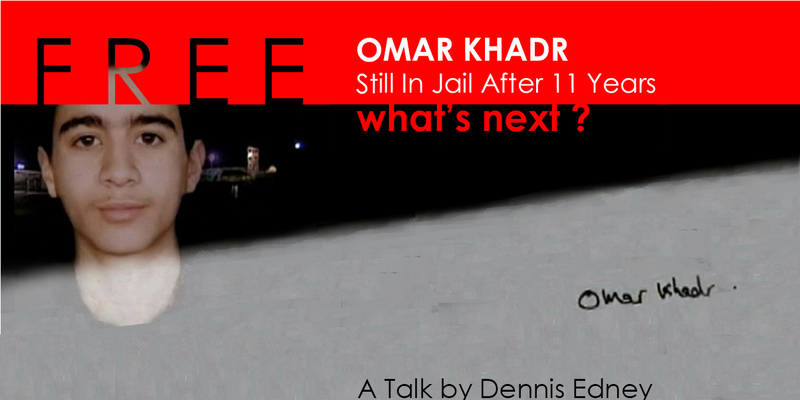 SFUHarbour Centre, 515 West Hastings St.
Omar Khadr was illegally captured by U.S. Special Forces in 2002 in Afghanistan when he was 15. The U.S. illegally detained him in Bagram and GuantánamoBay prisons until 2012. He is currently detained in the Canadian maximum security Millhaven Institution in Ontario. Dennis Edney has defended Omar on a pro bono basis for many years. He is the recipient of the British Columbia 2009 Human Rights Meda and has lectured internationally on the Rule of Law in the Age of Terror. This talk is organized by the Vancouver Free Omar Khadr Now Committee and endorsed by the BC Civil Liberties Association, CUPW/Pacific Region, Lawyers against the War, Lawyers Rights Watch Canada, No One is Illegal/Vancouver, StopWar.ca and the Seriously Free Speech Committee.